Dynamic Inventory’s fully customizable interface allows you to set stock thresholds, change the look and feel to your liking, along with many other features to make managing your purchase orders as simple as using your smartphone. We understand that purchase order management is not the most glamorous or exciting thing, but it is extremely important. Dynamic Inventory’s fully customizable interface allows you to set stock thresholds, change the look and feel to your liking, along with many other features to make managing your purchase orders as simple as using your smartphone. To this day, the best way to keep track of all purchases made from one company to another is by purchase order (PO). These official documents make for efficient recording keeping, and ensure all products are accounted for. Purchase orders are not just essential for making sure all your products are received, but in the event that an item is damaged, defective or otherwise unacceptable, purchase orders make returns to companies or manufacturers relatively simple. Historically, this process has been primarily facilitated by paper. Although paper has been a tried and true method of accounting in the past, paper trails such as these can lead down the dreaded road of non-compliance and the inevitable audit. 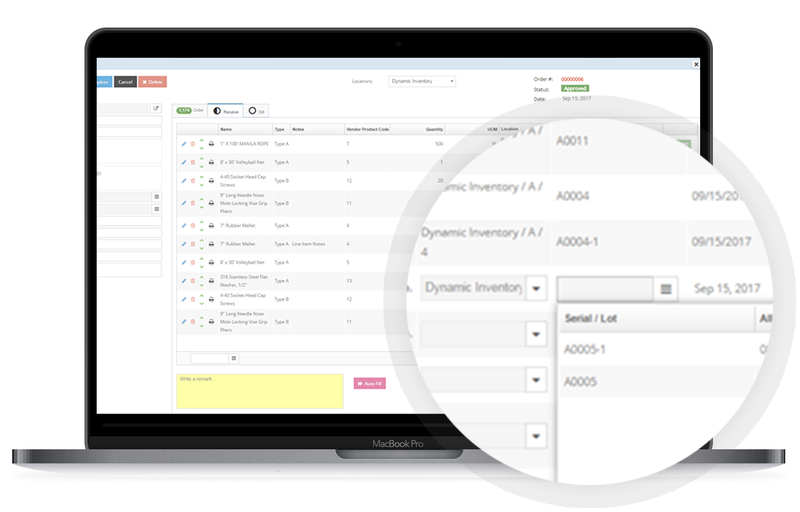 Because inaccuracies can be time consuming and greatly affect your bottom-line, Dynamic Inventory makes Purchase Order Management its top priority. Low stock notifications, pricing records, and monitoring functions make any buyer an immediate expert in efficient purchase management. These powerful features combined with Dynamic Inventory’s various export options are certain to keep both upper management and the Accounting department in full compliance and happy. 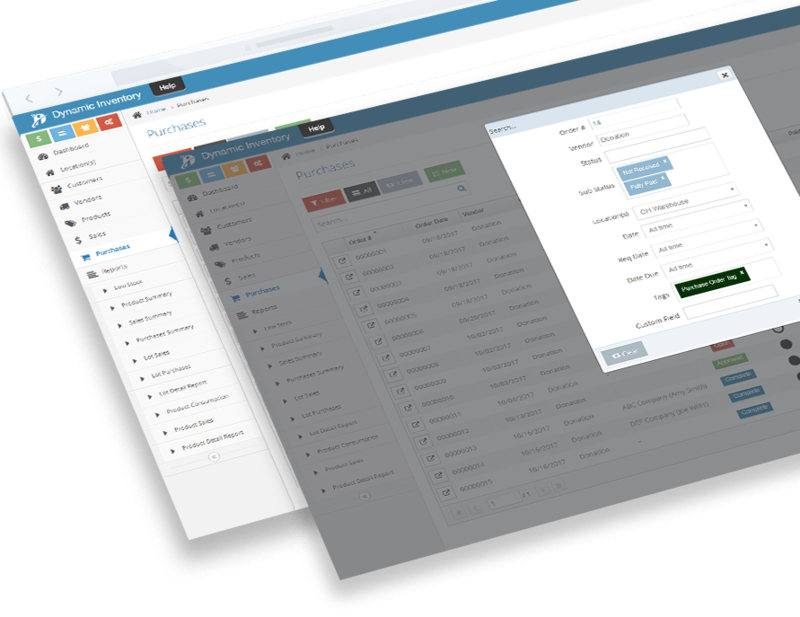 We are confident that you will find our purchase order management system so easy to use, that we want to offer you a free, no obligation demo. Would you buy a car without a test drive? We certainly hope not! Whether you are a small family business or a large corporation, Dynamic Inventory can manage your purchase orders with ease. Whether you are ordering small parts, components, clothing or equipment, Dynamic Inventory can keep track of these items, no matter how granular or how large. A purchase order can be defined as a record that tracks an offer from an organization to a vendor for specific products at an agreed upon price. There are several documents used in conjunction with tracking this record including: Purchase Order, Receiving List, and Purchase Invoice. The order document that details products, prices, discounts, and quantities requested from a single vendor. You are able to print, or email this document within Dynamic Inventory. A document that displays an organized list of items ready to be received from the vendor based on the order. You are able to print, or email this document within Dynamic Inventory. The financial document or bill that indicates what the organization has purchased from a specific vendor with details on products, prices, discounts, and quantities. You are able to print, or email this document within Dynamic Inventory. Browse some of the features in addition to purchasing that can help your organization succeed. With Dynamic Inventory’s sleek user-friendly interface, creating, issuing and printing purchase orders has never been simpler. Print purchase orders, receiving lists, and purchase invoices. Once threshold quantities are setup for products you will be alerted to any products that match the low stock threshold set. Initiate a new purchase order using the Re-Order button on the product detail screen. A purchase invoice record is kept against each purchase on the bill tab. Record payments made against the invoice/bill with reference to method of payment and date. Export all payment records using the accounting export tool. Select products from the order, or use a barcode scanner to quickly receive items ready to be accepted. 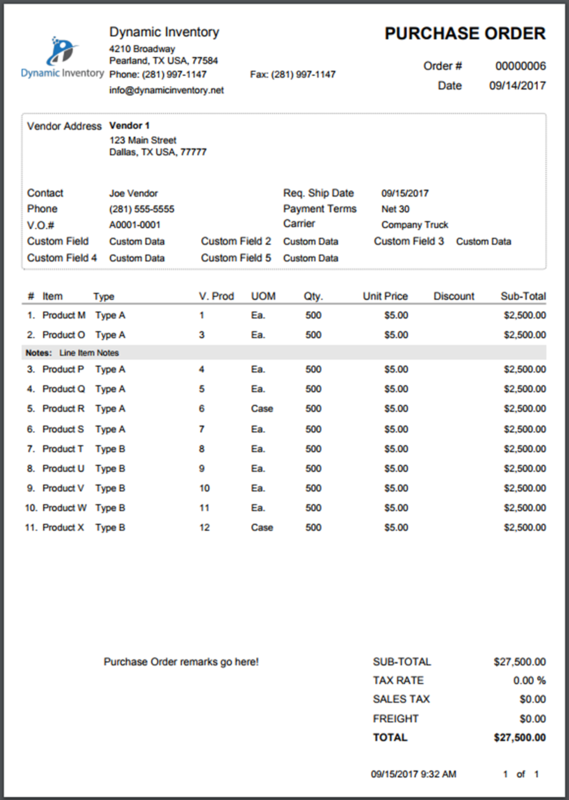 Reference the quantity, location, and lot/batch/serial for each line item on the Receive tab of the purchase order. Automatically populate vendor-defined pricing of products on the purchase. Associate products to vendors before creating purchase orders for total control over which items can be purchased. Learn how Dynamic Inventory can streamline your business today! The definition or meaning of procurement in terms of inventory management can be described as the action of buying products for money. An organization will procure items sold by one or more vendors. Each vendor could have a different price set for the exact same item, so it’s important to keep track of this price over time. Tracking procurement using a po tool or some form of e-procurement helps to acquire products at the lowest price possible to aid in turning a profit during sale. A thriving business will replenish items on a daily basis through procurement. These transactions are prone to mistakes, theft, and price fluctuations that can have a negative impact on the bottom line. A sophisticated inventory software is needed to accurately assess which items need to be procured, and make informed decisions on which vendors to purchase the items from. An iron clad procurement system that tries to prevents mistakes is a must for any business that has a steady flow of products coming in and out of their organization. It’s really easy to figure out how to operate. I jumped in and learned no problem. Specifically the order process is laid out very nicely in sort of a wizard fashion that helps prevent mistakes which I like a lot. Also the customization options are one of the main selling points for me. I like that I’m instantly reminded to purchase tires when my stock fell below a certain threshold. I thought it was really cool that I could set the the threshold for each individual tire line I sell. Smart thinking! Custom Fields and Tags solved all my problems. The support team was very responsive to my questions. Gone are the days of not knowing exactly what’s in stock, how much is left, or when you need to reorder your products. Search and Filter Many filters including status, order, location, vendor, and date. Sort by order total, payments, and balance owed. Search across text added to notes on the purchase order. Custom Fields Define custom fields to be used as placeholders for text that needs to be captured across all purchases. Tags Define labels and colors using tags to more quickly identify which orders need attention from the main search screen. Fulfillment and Payment Phases We have implemented a way to observe which purchase orders have not been received, billed, or paid; partially received, billed, or paid; and fully received, billed, or paid. Inspired by phases of the moon (empty, half, full, etc). Location Specific Accounting Choose to associate a store as the financial bucket for a purchase, and report on all purchases made against that store. Additionally, receive products to specific locations within our system. Order Print Outs Print or Email purchase orders, receiving lists, and purchase invoices/bills. Purchase Reports View/sort/filter on low stock, purchases summary, and lot purchases reports. All reports can be printed, emailed, or exported to Excel. Can I track payments made against a bill? Dynamic Inventory gives you the ability to export all payment records including bill payments using the accounting export tool. Does Dynamic Inventory offer customized purchase order printouts? Yes! Please contact our Sales Team for more details. Is Dynamic Inventory integrated with any e-commerce or payment processing sites? Not at this time. Please check back later! Am I able to email purchase order printouts directly to a vendor from Dynamic Inventory? Dynamic Inventory allows users to download, email, and print sales and purchase order printouts from the software.